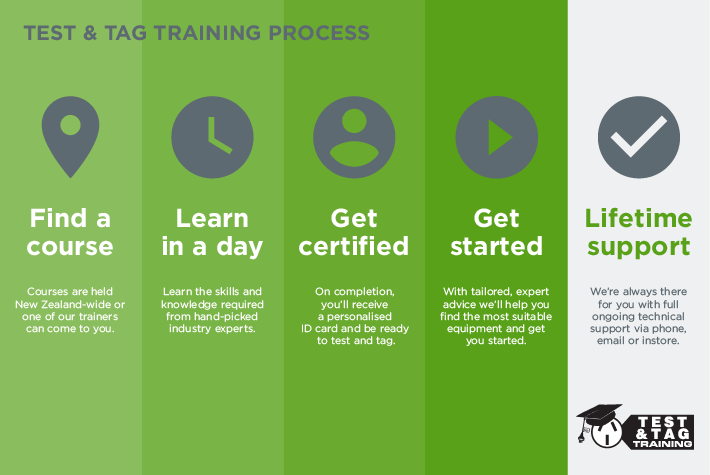 Test & Tag Training is a Registered Training Organisation offering a full range of training services to cater for the Testing & Tagging of Portable Electrical Appliances to New Zealand and Australian Standards 3760 & 3012. If you're looking to take part in a one day test and tag course, our highly qualified instructors will take you through every aspect of the Standards, while also providing participants with the relevant knowledge to competently carry out testing and tagging of all types of Electrical Appliances. Test & Tag Training currently have training locations in Auckland, Christchurch, Wellington & Hamilton with facilities designed for an enjoyable and practical learning experience. Our courses are limited to a small number of students to ensure that all who attend are given sufficient one on one contact with our instructor. Courses are available on a weekly basis and we are flexible with dates to cater for your needs. If you need to Test and Tag appliances within your own facility or starting up a business by providing the service for other businesses, Test & Tag Training will equip you with all the knowledge and equipment to start you off on the right track. Participants will be trained on the latest technology using a wide range of Portable Appliance Testers. Call us on 0800 111 779 to find out when the next course is on in your area.